Do you need a small, powerful, very portable, P.A system with a built-in radio mic? If the answer is YES, then this highly affordable mini system is for you. Great for small training groups, demos and presentations, this excellent mini P.A can be operated either as a hand-held device, or via it’s protective carry bag, or by attaching to a stand. No more shouting in the arena! The Horse Trainer Mini P.A can be used anywhere in the world (with a suitable travel adaptor), and be set up by a non-technical person in around two minutes. The System runs on mains or from the built-in rechargeable battery. 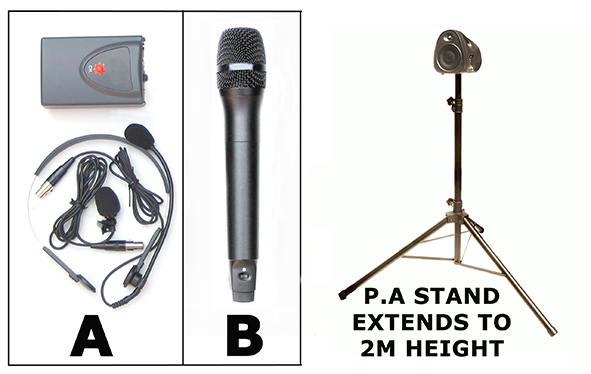 (Picture above): You can have either A. Headset/lapel radio mic or B. Hand-held radio mic with the Mini P.A. Model 1: 1 built-in wireless receiver, protective carry bag, with either headset/lapel mic or hand-held radio microphone. Price: £409.00 incl free UK delivery.